RemoteView takes your draft party to the Internet! RemoteView is a free web application that works with the PrimeTime Draft main application to show the current state of the draft board. RemoteView is intended for league members who cannot attend your draft party, but have access to the Internet. 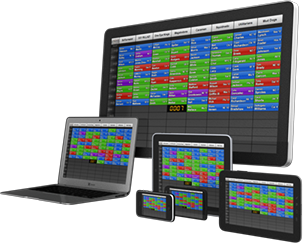 The RemoteView draft experience is nearly the same as the PrimeTime Draft main application, allowing users to see the entire draft board. And, for standard and salary cap drafts, remote users can even draft their own players! There are no additional charges to use RemoteView with your PrimeTime Draft license, whether you have one or several remote league members. To enable RemoteView for a draft, simply set "Enable Internet services" to "Yes" within the PrimeTime Draft main application. This will generate a unique URL for the draft which should be shared with the remote league members. The RemoteView web application is compatible with most operating systems and devices with a relatively modern browser, including Apple iOS devices (such as iPad®, iPhone®, and iPod touch®) as well as most Android™ phones and tablets. Due to the unpredictable nature of Internet Service Providers, Hosting Providers, and the dynamic nature of the Internet, we cannot guarantee that you will be able to use the RemoteView service at the time of your draft. We strongly encourage you to have a phone or alternate method of communication available as a backup. RemoteView doesn't currently support nominating players or making bids in Auction drafts. So, you will need to use another method (phone, Internet chat, etc.) to do these things. The RemoteView clock is only an approximation of the PrimeTime Draft main application clock.